The U.S. manufacturer has teamed with California-based car service Tesloop to gauge the efficiency of a tire embedded with a sensor that can monitor metrics such as pressure and temperature. While many vehicles today are equipped with tire pressure monitoring systems that tell you how low on air your tire might be, this system represents a step toward a more sophisticated approach that will be critical once fleets of self-driving cars hit the roads. “Tires are a mystery for most people, but if we can simplify how to properly maintain them or help make replacing them easier, that’s an area we can add value,” says Chris Helsel, Goodyear’s chief technology officer. The disc-shaped sensor is connected to the cloud through an app. Based on the readings, the app can suggest everything from adding air to recommending the closest tire dealer for a replacement. Tire rotation is suggested based on mileage. As cars become increasingly maintenance-free — particularly electric vehicles — tires become the part of the vehicle that take the most abuse and will need frequent replacement based on use. They are critical to vehicle traction because even the most sophisticated suspension systems can’t make up for a poor rubber contact patch. Goodyear officials say there is no immediate timeline for when smart tires will become commercially available. 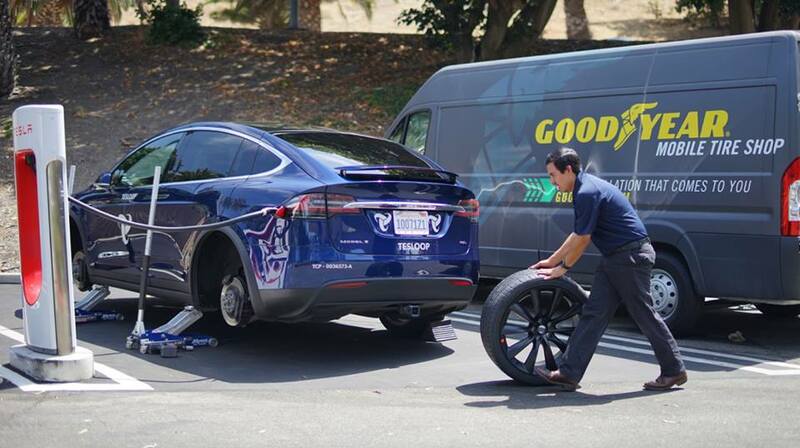 Goodyear chose Tesloop as a partner in part because of the high mileage logged by the service’s Model S and Model X cars. Tesloop currently has eight Tesla cars, which rack up an average of 17,000 miles a month, and will be adding eight more. It expects to add sensors to its entire fleet eventually. Founded two years ago, Tesloop offers long-distance rides that are meant to supplant train or even air travel. Depending on departure times, a one-way trip from Los Angeles to San Diego costs between $29 and $69. “For us, the appeal (of this test) is to eventually have a large and very automated fleet that we can monitor easily, because if a car has been running for 5 hours in 100 degree heat its tires will be in a different condition than a car that’s parked,” says Tesloop CEO Rahul Sonnad. “There’s a lot of learning to be done, and we’ll refine what we’ll eventually bring to market,” says Helsel, who adds that smart tires will cost more but he expects the price of such sensors to come down in time. Initially, he adds, Goodyear smart tires are likely to roll out as part of a new car from a major automaker. “In the end, though, these will be affordable as we push for better fuel economy and longer lasting tires,” he says.